With the upcoming launch of PlayStation 4, everyone here at PlayStation is hard at work preparing to deliver the best place to play — the absolute best gaming experiences imaginable. As you heard at E3, PlayStation Plus will play a huge role in delivering amazing next gen online gaming experiences, while offering incredible value to members. With a single PlayStation Plus membership, you’ll get all of the benefits across PS4, PS3 and PS Vita, making sure you always have something fun to play and experience online with friends. 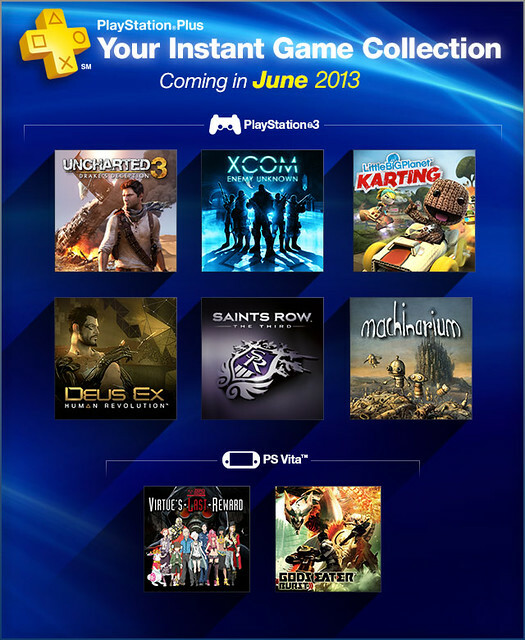 This week PS Plus has reached a milestone: the one year anniversary of the Instant Game Collection! PlayStation Plus has been around for three years now, and make no mistake, we’ve always felt that it was a great value for gamers. But at E3 2012, when the Instant Game Collection made its debut, we knew that PS Plus was delivering something innovative, exciting and unique. It was evident in the passionate responses you had in communities around the web that you agreed. From our very own PlayStation.Blog and PlayStation Community, to gaming message boards like NeoGaf.com, to your comments on gaming sites like IGN.com, Destructoid.com, Kotaku.com, we knew that you thought PS Plus presented a gaming service like nothing else out there. 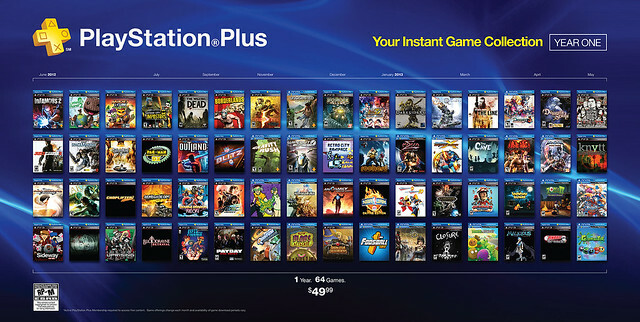 Looking back, it’s easy to see the tremendous value PS Plus offers. In the first year of the Instant Game Collection alone, if you own both a PlayStation 3 and a PlayStation Vita, 64 games were included, including blockbusters such as Sleeping Dogs and Spec Ops: The Line. We’re not stopping there. We’ve already started Year Two off with a bang with the announcement that #DRIVECLUB PS Plus Edition will be available in the Instant Game Collection at launch and one digital title will rotate in each month. We also debuted a powerful June lineup for PS3, including the introduction of three new marquee titles: Uncharted 3: Drake’s Deception (single-player), Little Big Planet Karting and XCOM: Enemy Unknown. Up next: the July month outlook next week, which is not to be missed! Whether you’ve been a member since Day 1 or you’re a newcomer, we thank you for supporting PS Plus and the Instant Game Collection. If you have yet to take the plunge, now is a great time to take advantage of the incredible IGC games offered on PS3 and PS Vita – while ensuring you’re locked and ready for the PS4 this holiday season. So that’s year one of the PS Plus Instant Game Collection! Which game was your favorite? Gravity Rush was my favorite by far. I had wanted it for a while but hadn’t made it around to buying it yet, and once I played it I loved every second of it. Sequel please! Thanks Sony! PS+ has released more games than I have time to play. It’s great knowing I will always be able to play PS+ games as long as I am a member. Deleting, re-downloading has become second nature. It’s like having an online game renting service!! I am a proud member and will be as long as I am able to game. Tie between Gravity Rush, BlazBlue, and Uncharted games. Honestly, Plus offering the first 2 episodes of the Walking Dead game are the only reason I checked it out. Finished it over Thanksgiving weekend, and wished I had give Telltale Games the full price. That is the best thing I can say about my Plus experience. I’m going to get a PS4 eventually, and if not day (or month) 1, will I be able to “purchase” the IGC content for PS4 via my PS3, and then download it later on the PS4 when I get it? WE DID NOT GET THE FULL VERSION OF WALKING DEAD . That one was before the instant game collection hit in June E3 2012, but yeah we did have that one in there back in the day! I always knew the value of PS+, but looking at that….I don’t know how ANYONE can deny the ultimate value that is PlayStation Plus!! Thank you Morgan and all the playstation team, great work, great year for sure, and greatness is still coming…there’s nothing better for a gamer to know that, to enjoy all this games free or not, and know that many more fun is just around the corner. In July I will complete my first year being a Plus member, and of course,I’m going to buy a new year membership without doubt. Glad to hear it, and thanks for your support! We got two episodes of Walking Dead through Plus. But the remaining episodes were on sale for a crazy low price for plus members, So we can let that half-truth slide. A whole of free games for only $50. I totally got my moneys worth for my PS3 and Vita. I’m excited to see the future of Plus as the PS4 draws near. I missed, Sleeping Dogs, Retro CIty Rampage, and Vanquish. All due to YLOD.. sigh..
Well I went and bought a PS Vita based on the sheer number of awesome titles I had for it, ‘purchased’ on my PS3 in the months before. Uncharted, Wipeout, Gravity Rush. I bought a Vita primarily because of PS+, and I’m so glad I did. Cannot wait to use it with my PS4 as well, got my pre-order sorted already. PS+ is just ridiculous value, thank you. Smart! Yeah you can easily start to build quite the collection on PS Vita through PS Plus, then when you get one, you’ll have a crazy library of games. As long as you’ve grabbed them free in Plus on the PS Store on PS3 or on the web. Uncharted:GA was my favorite. Knytt and BlazBlue are tied for games I was most surprised to love. People, The Walking Dead was released episodically, for $4.99 each ep. So getting the first 2 free was a $10 value. Why are people complaining about having to pay for the rest? It’s definitely given me a chance to play many incredible games I wouldn’t have tried otherwise! Totally worth it! The best deal in gaming. My favorites were Pac Man DX, Spec Ops, and NBA Jam I put a lot of hours into those games. Thanks for the GAF mention, we love ya Morgan. Looking forward to the days ahead. Also, more JRPGs please. Hi, Morgan, Plus is a ridiculously good deal but some people are just unreasonable so forget them. I buy games at launch so the ones I loved the most I already had, but my favorite of that category is Demon’s Souls. I hope other people fell in love with it as I did in 2009. I would pay the $50 bucks just for the cloud storage and the auto updates. Was really helpful that the recent update already downloaded while I was asleep, lol. Thanks for shepherding this valuable program for us for the last couple years. I hate that I have all these games, and the PS store is so absolutely terrible at showing me what games I have a license to download. I have to scroll through hundreds and hundreds of downloads in reverse chronological order. I wrote a command-line tool called “sen” to allow me to search the whole store, and my downloads, and mark them for download so I download them when I next log in. Pretty awesome. On githhub (under “pudgecode”). Work in progress. You’re making it seem like there will only be a single game every month for PS+ with the PS4 when you say one digital title will rotate in every month. Is that accurate? Will we only see DriveClub + 11 more PS4 titles in the first year of PS+ on the PS4? I vote PVZ, and Sleeping dogs as the best free games. If not for the IGC giving the 2 free episodes of the walking dead I am not sure I would have ever played that wonderful game so that is a huge deal. Decent game selections, prompt updates, and I only paid $39.99 for one-year subscription, I have absolutely zero complaints for PS+. I subscribed to PS+ on 6/29/2010 and I am currently paid up until 12/11/2021. This is how much I appreciate the program and how it covers my PS3, Vita and the forthcoming PS4. Whomever is NOT a PS+ member you are seriously missing out. The game value alone well over pays for itself then you add storage and discounts. Yes sometimes the games are that great but then the next update makes up for it. Cant please everyone all the time but PS+ sure does try. The game I played the most from IGC is easily Infamous 2. Also got a lot of play out of LBP2. R&C All4One makes me angry: I bought the disc, but my saved game is incompatible with the digital version. That’s crap. Sorry, it is. It’s not like I want to give away or sell my disc version, I just want to not stick the disc in my drive to play it. Looking back I haven’t played many of these games very much. Pinball Arcade, Joe Danger 2, Quantum Conundrum, Pac-Man DX, NFL Blitz, Machinarium, all get good time. The smaller games are in some ways the biggest values. I’d like to play Spec Ops and Sleeping Dogs, but just haven’t really gotten around to them. I am going to spend a lot of time playing Uncharted 3 single player. Aw, stop teasing, what are the July IGC additions? Sleeping Dogs by far my favorite + game so far. I subscribed to Plus day one and love the service, but I’m just a teeny disappointed we haven’t yet gotten Batman AC, Hitman Abs or Amalur like EU has had for a while now. You’ll find out soon enough next week! Um the image you guys used the Scott Pilgrim vs the World box art is not the actual box art, unless there is going to be a Scott Pilgrim vs Street Fighter game. I love PLUS. Who has ps3 that so lucky to get all these games to play. But I choose to buy PSVITA coz I love to bring my ps vita out with me so hope PS VITA could have more top games like PS3. Gravity Rush is the reason I bought a Vita, and consequently the reason I subscribed to PlayStation Plus. PlayStation Plus is the reason I bought a PlayStation 3, and will buy a PlayStation 4 when it comes out. To think that I wasted this entire console generation on a competitors platform. The Last of Us is the only game I’ve actually purchased for PlayStation 3. Well the pictures says it all about the great value that PS + offers us… Nevertheless, i would like to thank you guys for this great service!! Count me in as a subscriber for the whole length of the next gen!! Nice poll, though it was pretty hard to find. Its hard to choose a favorite out of all those great games but for PS3 I was most excited about Darksiders, Ratchet & Clank & Borderlands(though I hate FPS games, I loved the RP of it). As for Vita I’d have to say Disgaea 3 was my favorite. Still need to play Ninja Gaiden but I tried for 1st couple levels & loved it. Also the GREAT discounts thru out the year got me quite a few more good games. I wonder if you could start sending polls through the Playstation mail system though, that way more people would vote I bet but it might be difficult if you used the Check boxes. Thanks again for the great years of gaming! I don’t like that you presented it this way. Makes it hard for me to complain about Playstation Plus. Come on guys. I live a sad and pathetic life where the only joy I receive is complaining every day about the latest Playstation Plus game. If it is a game that is outside my very narrow gaming tastes, I can complain. If it is a good game that does fit my tastes, I can complain I already have the game and you should have known that. Some of us need this stuff to complain about. If you don’t give us something to complain about we might have to think about real world problems that are worth getting outraged over. I hate you all. CONGRATULATIONS ON AN AMAZING SERVICE!!!! PS Plus is by far the best value in gaming. The amount of free content that you guys offer is simply incredible. My favorite game offered (that I didn’t already have) is Sleeping Dogs. I felt so bad not having purchased it before that I bought the game after getting the PS Plus version to support the developers. For the second year, I’d love to see games like Red Dead Redemption, Sonic Generations, Far Cry 3: Blood Dragon, Guacamelee!, Motorstorm: Apocalypse, Twisted Metal (that would revive the online for that game), Starhawk MP (same), PSASBR, etc. I’m mostly satisfied with the Vita games, but PS3 games were also incredible good. I’d like to see MGS HD Vita soon. Did you even take the poll? It clearly says the 1st 2 episodes. @31 damn 2021, I thought 11/14/2016 was a long time. Damn when you group it all together like that you can really see just how bad the selection and quality of the games we’ve been able to rent from the BBRC. Hopefully they make some major improvements to the BBRC in the future, or get rid of it entirely already and bring back the good version of Plus. Give us the option to buy Cloud save space only already. That’s the only benefit I’ve gotten out of Plus in a long long long time. Not worth 50+ a year though, unless you start adding higher quality, more diverse, newer, full PS3 games to the Rental collection.